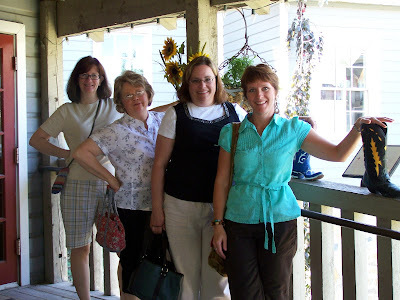 Me and my posse made the trek to the Wasatch Front (Salt Lake City Utah area) for a day of shop hopping. This post really is for Shelto and Stitch who didn't make it this year. No one else will appreciate it. We missed you, we talked about you and we spent money without you. 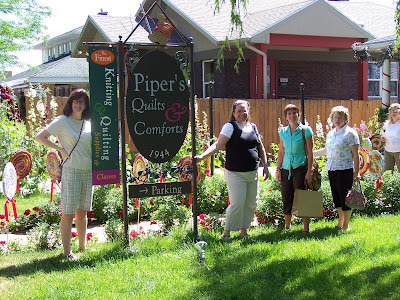 Bloggers, if you would like to enjoy a really beautiful rendition of the experience with lovely pictures of quilts and classic shots of things we quilters love to touch and talk about, then this is NOT the post for you. 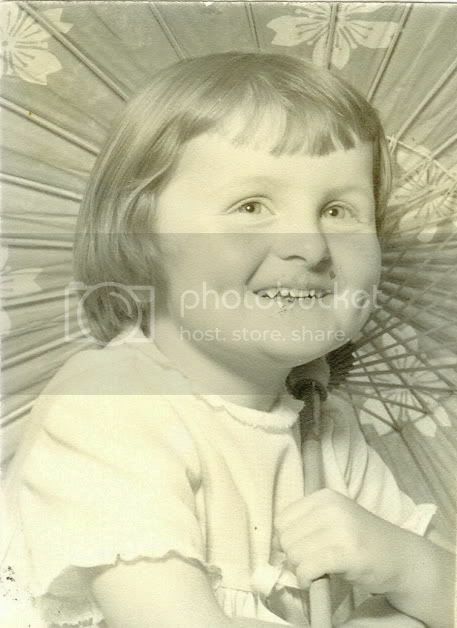 Check out Nanette over at Freda's and Kim over at Bitty Bits. THAT is what a shop hop is all about. I tried. This coconut tree was just needing a little love. And I think Karebear and Leela are giving it up. Although, Leela thinks she's doing a Verizon commercial. I'm not paying for this picture. The sweet little helper bee at Elaine's could not figure out why we were taking a picture like this. Don't you want to be somewhere else? Uh, no. She just doesn't know us very well, does she? Notice, Karebear's eyes. She was tired and it was only 11am. Here's a pretty picture of quilts. I guess I did okay. 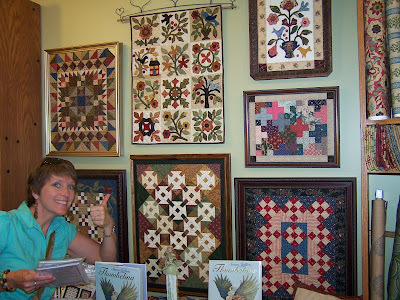 Leela and I really fell in love with these quilts in frames.We ooohhhed and aaahhed. We discussed all the things we were going to do and where we would put OUR frames in our homes. We carried the patterns around with us the whole time and just before we left we looked at each other and said, "Who are we kidding?" and promptly left the patterns somewhere in the Malibu Monkey area. Yeah, we're THOSE kind of shoppers. Sorry Elaine's. They're by the striped beach balls. Okay, the girls insisted on this photo in front of the lollipops. Okay, alright already. It goes south from here. D-Rae is thoroughly disgusted to be putting her hand IN the boot. "You never know where these boots have been". This isn't a bowling alley, for heaven's sake. They are here for SHOW. I'm sure they've never been worn! Leela, I said I wanted your hand IN the boot. She never follows the rules. Again, she thinks she's doing a commercial for Acme Cowboy Boots. but I'm pretty sure that they hired D-Rae on the spot. I just was enjoying this sign. I thought the setting was inspiring. Sign at Piper's Parking Lot. 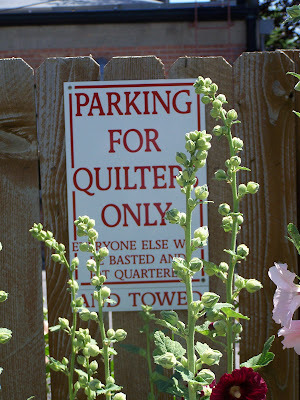 You have to love this if you're a quilter. Everyone else will be basted and fat quartered. Last picture, last store, last step. The ONLY one in the picture who has her eyes fairly open is KAREBEAR. When she shines, she really shines! This picture brings me so much joy I cannot even tell you. Whenever I am sad I will come here and be instantly cheered up!!!!! 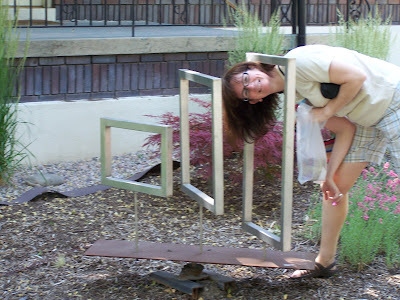 Why, oh why, these women put up with me is beyond my comprehension. But I am soooo very thankful you do. No one else will play password and Celebrity Name Game for 3 hours with me. And before you think I'm a horrible, horrible friend, remember I'm laughing at you with you. Shelto & Stitch I have video, too!! I'll be posting that shortly. I know, you can't wait. Neither can I! Well there must be some inside jokes there but what a fun group of friends to go together on the shop hop. Fun for all of you! Thanks for sharing with all of us. How far a drive is it for you? Sadly, there are no inside jokes --we are just wierd! It looks like you had soo much fun. Oh,my! 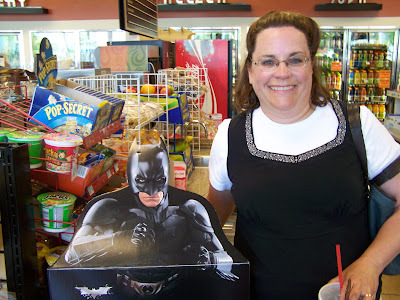 I've been to those stores...my son and DIL live in the SLC area and they always take me shopping when I'm visiting! I can even drive to Elaine's all by myself now that I know the way. Missing my kids after reading your blog...But it's a good feeling. Glad you enjoyed the day. I love shop hops, and you guys look like you had a blast. I really like those framed quilts too but they just scream "you know you'd mess up and have to rip us out to make all these little pieces fit right threeundertwo!" I'm wondering are you by chance in Idaho Falls? 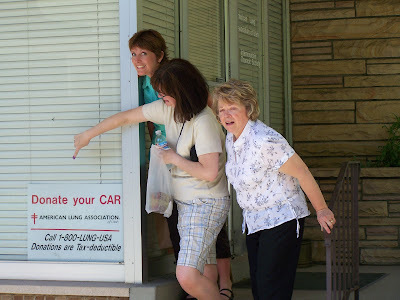 I'm in IF and looking at these photos 2 of the women look familiar from quilt guild--well from when I went to our local IF quilt guild a few years ago. Anyway just curious. Sometimes this world is very small! HOLY COW!!!! You were at The Material Girls and how did we not see each other! 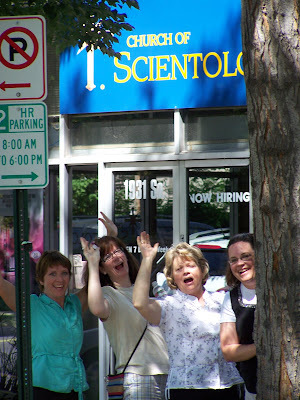 For those who don't know what I am talking about---The Material Girls is the FAB quilt shop in Utah and the first photo has our sad and droopy Coconut Tree out front with you gals! 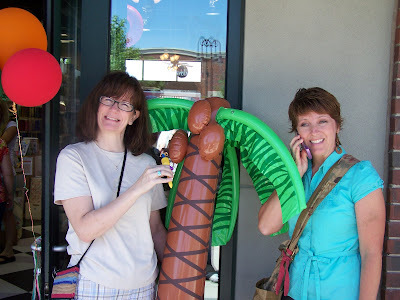 We had a Hula Theme going- I wore a hot pink Hula Skirt too! 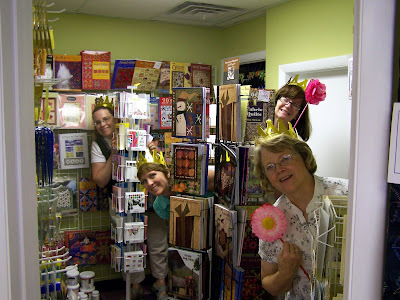 I WORK at Material Girls-- yes I AM a Material Girl! :) I worked on Wed and Thur so I may have missed you girls--too bad! :( Another brush with one another but still no in person chatting! We will have a chance at some point I am sure. 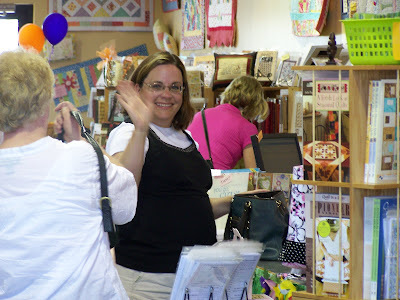 It was fun to see my favorite quilt shops featured on your blog! LOVE Elaine's, the quilt in front of the stair railing with all of you behind it, is my pattern and quilt- only the top bit shows in the photo though. Piper's is a fun shop too. Kari -Fresh Cut Quilts Pattern Co. 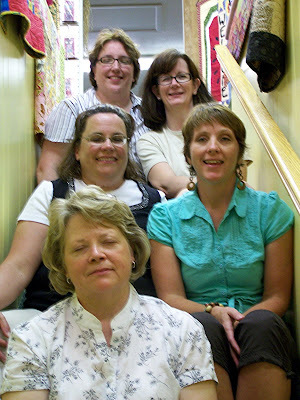 Thanks so much for stopping by Material Girls Quilts. It looks like you girls had a great time! 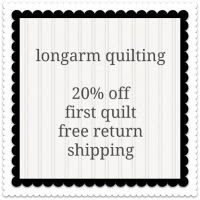 Be sure and stop by again. Houw do I activate my email address?? I am a clueless blogger I have to say. It is all very new to me and I have a huge learning curve still! My email address is freshcutquilts@gmail.com Des! Sorry I am a putz when it comes to this stuff.